Well…I feel like we launched this challenge and then disappeared from the blogsphere. I intended to post an update every week but I skipped over week 2. This isn’t new news to me but it has definitely been brought to light again here – when you are super busy and make a new commitment, sometimes another thing on your to-do list has got to go. Your priorities have to shift sometimes even though the thing you have to let go you don’t dislike or, in fact, enjoy it a little more than the new thing you committed to. I made the commitment to the 30/30 challenge. We are an active family but not consistent. I wanted to commit to exercising at least a little every day to improve my health. I wanted to get int he habit of moving more and sitting less. The problem is that I was spending so much time SITTING on my computer – blogging, emailing, reading other blogs, commenting and managing our social media. A significant part of my day was spent doing that. I didn’t spend as much time walking as blogging but since my goal was also to sit less and move more I was also concentrating on things I could do around the house that didn’t require sitting…and those weren’t blogging. So I guess this is my long-winded reason for not blogging lately. I am not happy about it though. Honestly, I know the walking is good for me and I like to walk but not as much as I like blogging. I will be spending the rest of the month trying to find that balance in my life that allows me to do both. As for how the actually challenge is going for us so far? Good. I admit that on one of my professional dog walking days I got in over an hour of walking but Chester and Gretel didn’t get any. The weather was super nasty that day. The rain was like pins and needles and blowing sideways. 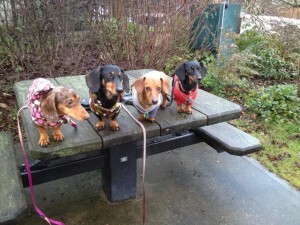 I had to coax my dog walking clients (Dachshunds) around the neighborhood. When I got home I was wet and cold and was tired of dragging dogs around the block so I crawled onto the couch with Chester and Gretel. We’ve been really lucky during this challenge. When I really don’t feel like walking I can call our friends up the road and they come walking with us. Rufus, Porter and their Mom have been really supportive and a big help. It’s easier to stick with something if you have someone you are meeting. So far we’ve made it out every day, but we did count the nursing home visit as our walk one night. Let me know if you find the secret to that ‘balance’ you mentioned about. I could use some of that too! So far, we’re one big fail! Like I mentioned in our post the other day, the fog has been a HUGE issue. We’re on day three of fog so thick that you can’t see a foot in front of you! Luckily, the Daddy has been really great about walking the dogs during the day, so even though I’m not getting many miles in – they are. I guess that’s all that counts, right?? Finding the balance is hard! I’ve found that if we can walk 3 or 4 times a week it is enough. I’d love to walk every day but it isn’t realistic when you are busy. Too bad we can’t walk the dogs and blog at the same time! Ah … the finding of the balance! Yep, it’s difficult, isn’t it? Actually, one reason I wanted to join this challenge (and the art challenge I also picked up at the same time) is because I realised I was spending far, far too much time at the computer. I’ve been posting updates on my blog each Friday, with what I managed each day. I don’t feel so bad now I’ve read your post, but I was feeling a failure, because some days this week I only managed 20-25 minutes on three days. We did take them out every day though, and to be fair, the weather has been snowy and icy and I have a tripod greyhound recovering from a leg injury (he was off his legs altogether for three days at the end of December, so we have to take it slowly with him). One: Does it count as 30 minutes of walking if it’s split into two? We usually go out for a longer walk in the morning, and a quick ’empyting’ walk in the evening and sometimes that evening walk can be 15-20 minutes. Two: When I take Sid (tripod) to hydrotherapy for swimming, does that count as a ‘walk’? He’s certainly too tired to do anything but sleep afterwards! In my book the swimming counts too. I think normally it wouldn’t but because your dog has special circumstances it counts. Really, the challenge is about getting out and getting active…hopefully more than you have been or more consistently than you have in the past. Yes, the swimming certainly counts for Sid, because it’s very tiring for him. All I do though, is drive there and stand around – after a quick five minute walk around the property for Sid to empty himself. Well done. We went out in the snow today and I had a great time. Have a super Sunday. This past week was one big fail! I went back to work after a month off for surgery and recovery; this put the dogs in tailspins! They had the house with access to the yards through the dog door but between 12 hr shifts (which were always longer – HA), I was lucky to get them and me twice fed :). This weekend is better – walked yesterday and will again today but not always Justus (who had a photo shoot on Thursday for a local newsmagazine’s pet edition). Took in new dog Denali, Spaniel mix and am working/training a lot with Sydney, new Beagle boy with issues. So my attention has been somewhat scattered. I applaud “Houndstooth” for her consistency – it’s where I want to get and why I joined the challenge. My blogging, too, went to the wayside this week with the adjustments. C’est le vie! I’m beginning to suspect that life is the pursuit of balance, not the actual attainment 🙂 Good luck as you continue being a healthy blogger! I think you are definitely right. Since our responsibilities, goals and interests always change there is always a need to find equilibrium. Your challenge is great. You’ve inspired so many people and if each person gets in one more walk than they normally would, they (and you) have had a big success. I’m thrilled to hear that you’re working to create a balanced life. Maybe one compromise is blogging standing up (at a counter) or using some of your walk time to brainstorm posts. But please don’t feel like you’re letting anyone down. Gretel and Chester are happy for every walk they get. And we’re happy to read about your adventures whenever you have time to share them with us. I didn’t say there was no guilt! ha, ha. It does weight on me when I feel detached from the blog world but I am able to give myself permission to let go. It’s still never totally ok though…just something I recognize as a necessity sometimes. I have downloaded a voice recorder to capture blog post ideas. I used to try and write them down but that takes longer, two free hands and I would usually misplace them anyway 🙂 I plan to use the voice recorder on walks some but I admit I am torn because I don’t want to feel detached from Chester, Gretel and our surroundings. I still have hole that balance can be achieved…or at least improved upon. We don’t have a choice because the house rule is the yard is not a bathroom,so we have to go out on walks 3x a day, but we are fine with that and mom does spend a lot of time on my blog and social media too and then there is this thing called work that she really puts a lot of time into. It all works out in the end. Hmmm…I like that rule. Unfortunately I am too lazy at 5 am when they want out and I want back back to bed to stick with something like that.